Edain Butterfield was born in St. Louis, Missouri and grew up in southern Illinois. She graduated with a B.A. in Political Science and a B.A. in Music from the University of Colorado, Boulder in 2006. 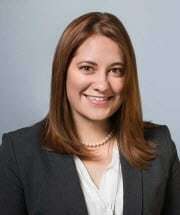 Edain obtained her Juris Doctorate in 2009 from Brooklyn Law School in Brooklyn, New York. After law school, Edain lived and worked in New York City as an immigration attorney for 8 years. She represented clients from Central and South America, the Carribbean, Africa, Europe, the Middle East, and East and South Asia. Edain has represented clients before U.S. Citizenship and Immigration Services, U.S. Department of State, and the Executive Office for Immigration Review. Edain moved to Denver in May of 2019 and joined Hernandez & Associates, P.C. in July of 2019. She now focuses on removal defense and providing quality and compassionate legal services to clients being held in immigration custody.